NWA World Champion Adam Pearce and Jeremy Wyatt deliver a wrestling classic at 3XW. Make no doubt about that the NWA World Champion Adam Pearce is the most influential NWA World champion since the “Nature Boy” Ric Flair. Missouri Wrestling Revival was on hand in Des Moines, Iowa as he defended his title against the NWA Central States Champion Jeremy Wyatt. In a packed house, with many of the top sports photographers in the Midwest as well as Pro Wrestling Illustrated own Wayne McCarty shooting photos, you had to be there. The reason being that many felt it could be an historic night for Jeremy Wyatt as he would add the “ten pounds of Gold” to his collection. The two warriors battled in and out of the ring at a vicious pace. Pearce would show his power early on as he looked to easily avoid Wyatt’s feared crossface finisher. Wyatt though is a master tactician who systematically took Pearce off his game, hitting him high with flying body crosses and continued to try to lock in the crossface. The rabid fans were on their feet screaming and pleading for Wyatt to capture the title. 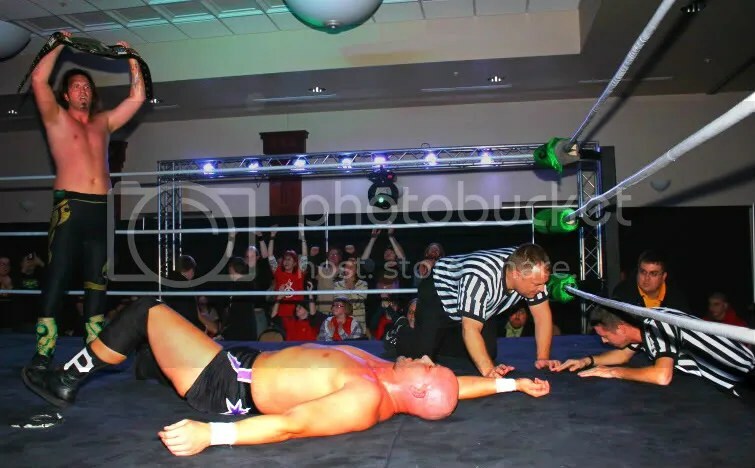 One moment would change the match, as 3XW head referee Jeromy Robb was in the corner out of the way, only to find himself in knocked out moments later as Pearce and Wyatt went full force in his direction thus knocking Robb out. Moments later Wyatt locked in the cross face once again and Pearce tapped but with no ref to make the call it was all for naught.. Then it happened, Wyatt’s arch rival and 3XWrestling Champion Mark Sterling came out to interfere in the match. 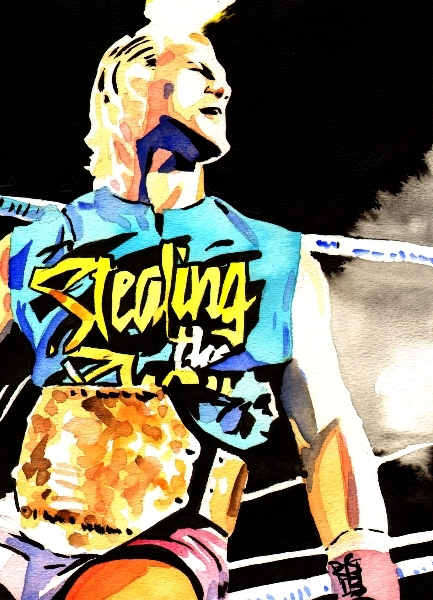 Wyatt, would derail Sterling’s attempt with a stiff blow and went back on the attack on the World Champion. Problem was that Sterling had given the champion the time to get back on the offense, and Pearce had Wyatt where he wanted him. Sterling, though could not help himself and attempted to nail his vicious spear on Wyatt only to have Wyatt move at the last moment. You could see Pearce’s eyes roll back in his head as he had been annihilated with one of the most brutal spears ever from the “Iron Man” Mark Sterling. Wyatt would take out Sterling and threw him out of the ring, and seconds later 3XW second referee Steve Biley entered the ring as Wyatt went for the cover for the win. BOOM, The roof at ALL-Play exploded as the fans came to their feet. To be honest the last time I felt that feeling was when I was in St Louis for the Cardinals playoff game against the Philadelphia Phillies at Busch stadium. The place rocked as cards reliever Jason Motte had Phillies third baseman Placido Polanco with 2 strikes in the 9th inning. Then with one more pitch Motte ended the game as Polanco flied out to center for the final out of game 4 and allowing the Cards to make it to game 5 of the first round of the NL Playoffs. I could barely hear myself think, at ringside as fans were elated with happiness. 3XW announcer Daryl Moon shouted loudly on the mic that drinks for everyone was on the house from the NEW NWA World Champion Jeremy Wyatt. A promise that Wyatt had made prior to the match via the media and facebook. As Wyatt held onto the NWA World Championship title, he knew he would be out over 250 plus drinks but would be celebrating with the prestigious ten pounds of gold around his waist. 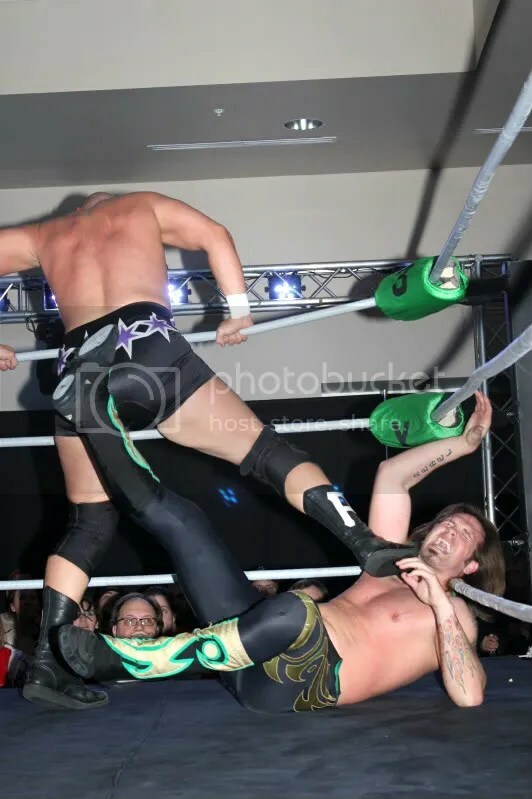 As head ref Jeremy Robb came to he told the referee that made the three count that, the match was indeed reversed decision as Robb would state that the he saw Wyatt Sterling hitting Pearce with the spear thus disqualifying Wyatt. Pearce was knocked out as Sterling celebrated outside of the ring with a smile ear to ear. Rightfuly so Wyatt was furious dove head first onto Sterling, and the two brawled through the crowd as Wyatt looked to get revenge. The deciding factor would be the NWA World Champion Adam Pearce who sneaked attacked Wyatt from the back. There was nothing that Wyatt or the furious 3XW faithful could do as two of the best wrestlers in the world continued a brutal beat down on the NWA Central States Champion. In one of the most disgusting acts I have ever seen Sterling locked in his Markshooter while Adam Pearce taunted Wyatt with the belt claiming that he would never be able to be the Worlds Champion. At the end of the night Wyatt proved that he was more than capable of being the best in the world, and as the NWA World Champion Adam Pearce lays his head down tonight he will know he got away with one in Des Moines Iowa at 3XW. Yet, the champ is not home free yet in the Midwest as the NWA World Champion continues his impressive world tour as he travels to Council Bluffs, Iowa tomorrow night for Magnum Pro Wrestling. His opponent is non other than “Baby face “ Tony Cortez, a man who is just as capable to become the NWA Worlds Champion. MWR will be there, to cover the NWA World Champion Adam Pearce once again as he enters a hostial environment where Cortez is a local legend. We hope you join us for Magnum Pro Wrestling’s one year anniversary for a night of action that you will not want to forget!! This entry was posted on January 28, 2012 at 4:55 am	and is filed under Uncategorized. You can follow any responses to this entry through the RSS 2.0 feed. You can leave a response, or trackback from your own site.